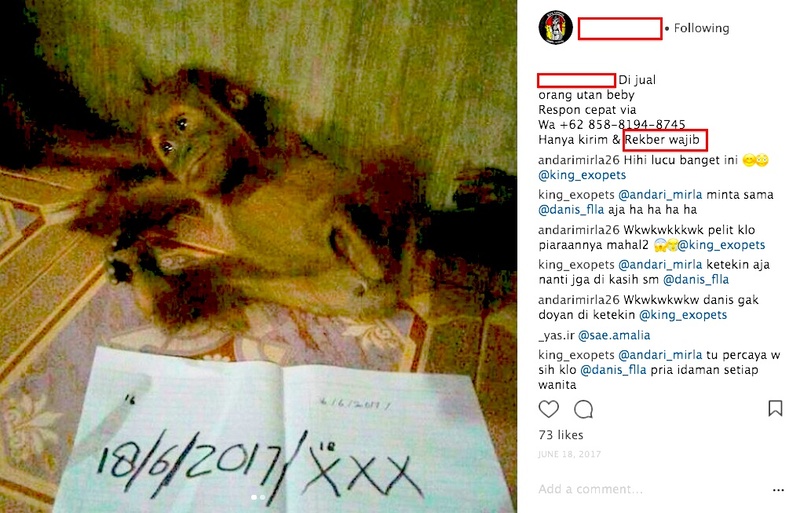 PEGAS has been monitoring online social media accounts for over three years, finding wildlife dealers who sell great apes captured in their forest habitats to the highest bidder. 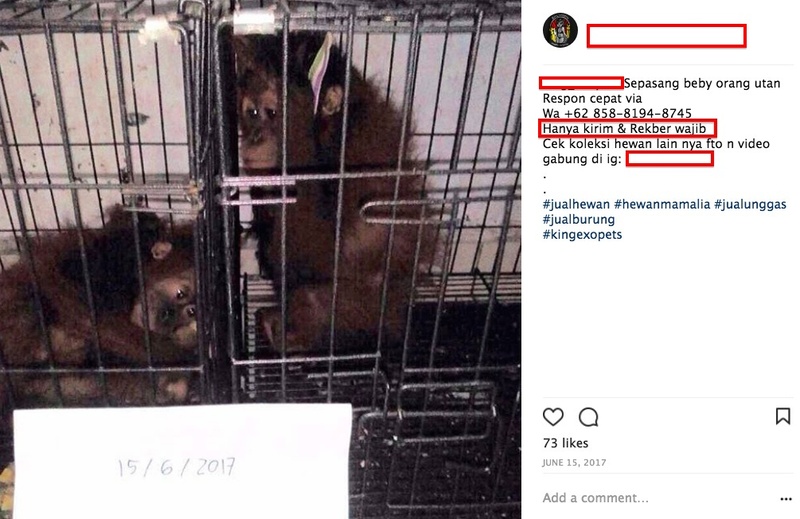 Dealers in Indonesia are amongst the most active of these ape traffickers, especially of the lesser apes (gibbons and siamangs). 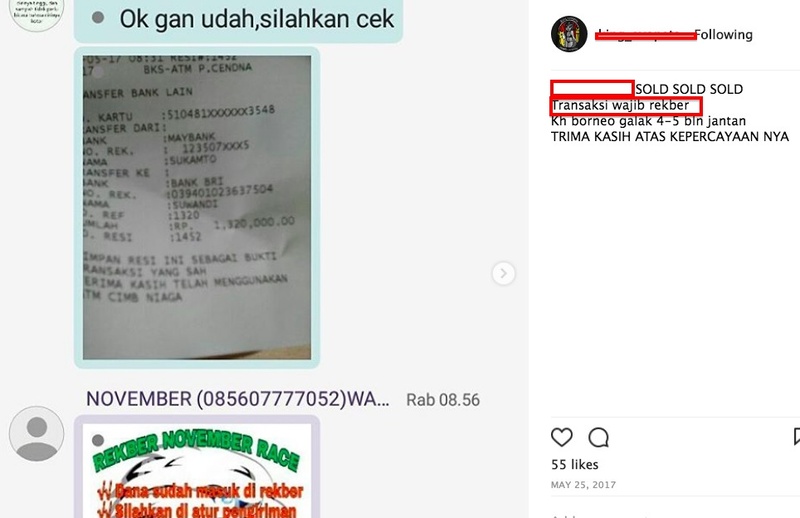 The Facebook or Instagram posts of Indonesians are always in Bahasa Indonesia, the local language. PEGAS struggles with Google Translate to try to figure out what they are saying. One word, even in very short comments, keeps recurring when an animal is offered for sale: ‘rekber’, often with the word ‘wajib’. ‘Wajib’ is translated as ‘required’, but no translation could be found for ‘rekber’. The fact that business PIN numbers are almost always given by dealers indicates that CITES Appendix I species – supposedly protected from commercial trade – are being trafficked with a veneer of legality. 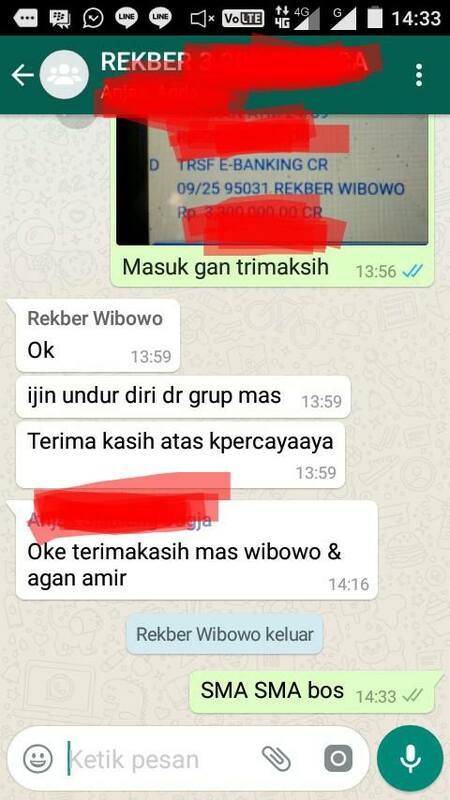 One day PEGAS got lucky when a big Indonesian wildlife trafficker gave a short tutorial on what ‘rekber’ meant and how it operated. The word is an abbreviation of ‘rekoning bersama’, which means ‘joint account’. There are several private rekber services comprised of individuals or companies that have set up bank accounts to act as escrow services. They make money by charging a service fee for the financial transaction (e.g. RekBer CeperzBank, ceperzbank.com; RekBer IndoBank, http://www.rekberindobank.info; MangRekBer, http://www.mangrekber.com). 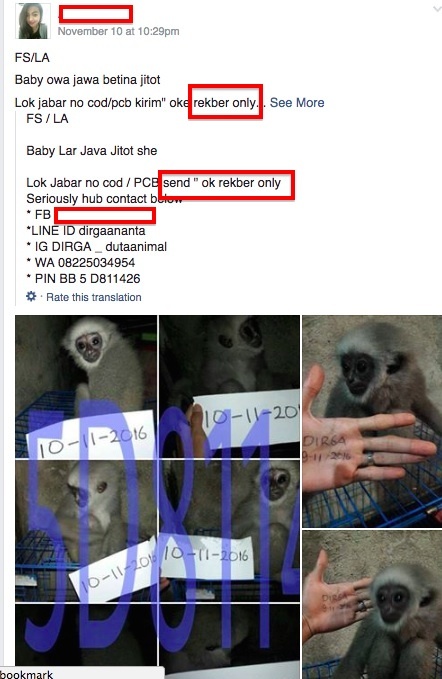 Here is how it works: the dealer and buyer agree on a price, for example, for two orangutan infants, let’s say Rupiah 140 million (~USD 10,000). They go to an online Rekber service. The service cannot release funds to the seller (i.e. dealer) until the buyer gives the thumbs up. 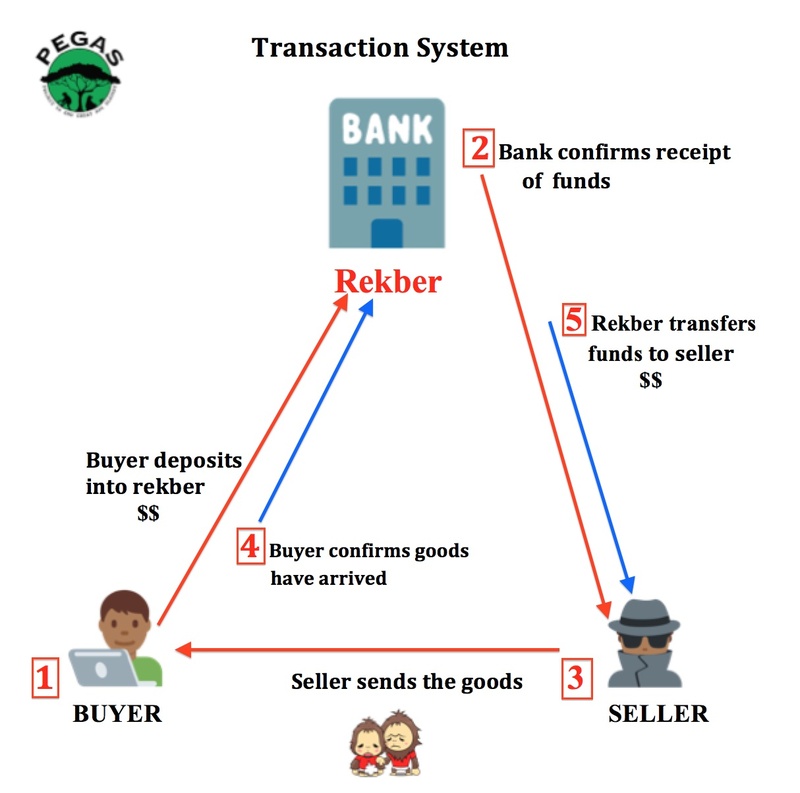 Then, (1) the seller deposits the agreed price into the account, (2) the service informs the seller that the funds are there, (3) the dealer ships the orangutans, (4) the buyer informs the service that he has received what he paid for and (5) the service releases the funds to the dealer. So Indonesian banks are facilitating illegal wildlife trade, albeit without direct knowledge of what is being traded. These services are not registered as banks, which means that they operate largely on trust between the buyer and seller and the service entity. Regulatory steps need to be taken to ensure that Rekber services are not used for trade in illegal commodities, or for illicit financial flows in the form of tax evasion and money laundering. This entry was posted in online trafficking, Uncategorized. Bookmark the permalink.